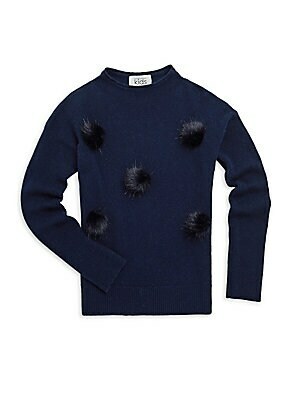 Fuzzy pom poms offer a quirky aesthetic to sweater Crewneck Long sleeves Pullover style Rib-knit hem Merino wool/cashmere Dry clean Imported. Children's Wear - Contemporary Children. Autumn Cashmere. Color: Navy. Size: 6. 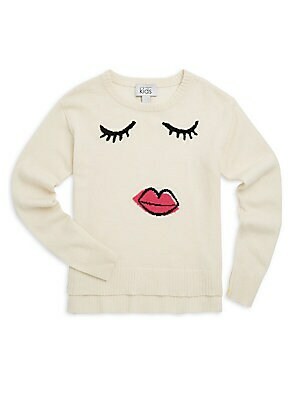 Serene lashes and lips lend cute aesthetic to sweater Crewneck Long sleeves Rib-knit neck, cuffs and hem Pullover style Step hem Merino wool/cashmere Dry clean Imported. Children's Wear - Contemporary Children. Autumn Cashmere. Color: Tofu. Size: 10. Serene lashes and lips lend cute aesthetic to sweater Crewneck Long sleeves Rib-knit neck, cuffs and hem Pullover style Step hem Merino wool/cashmere Dry clean Imported. Children's Wear - Contemporary Children. Autumn Cashmere. Color: Tofu. Size: 12. Serene lashes and lips lend cute aesthetic to sweater Crewneck Long sleeves Rib-knit neck, cuffs and hem Pullover style Step hem Merino wool/cashmere Dry clean Imported. Children's Wear - Contemporary Children. Autumn Cashmere. Color: Tofu. Size: 14. 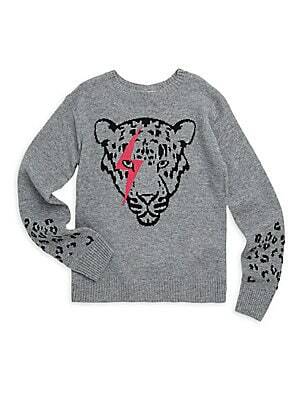 Soft merino wool and cashmere sweater with cool leopard graphic. Crewneck Long sleeves Pullover style Ribbed trim Merino wool/cashmere Dry clean Imported. Children's Wear - Contemporary Children. Autumn Cashmere. Color: Grey. Size: 10. Soft merino wool and cashmere sweater with cool leopard graphic. Crewneck Long sleeves Pullover style Ribbed trim Merino wool/cashmere Dry clean Imported. Children's Wear - Contemporary Children. Autumn Cashmere. Color: Grey. Size: 8. 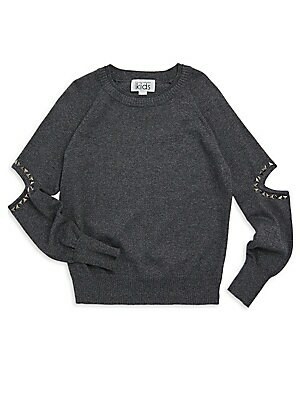 Studs accentuate sleeve cut outs on raglan top Crewneck Long sleeves Studded elbow cut outs Rib-knit neck, cuffs and hem Pullover style Cotton Dry clean Imported. Children's Wear - Contemporary Children. Autumn Cashmere. Color: Tweed. Size: 8.